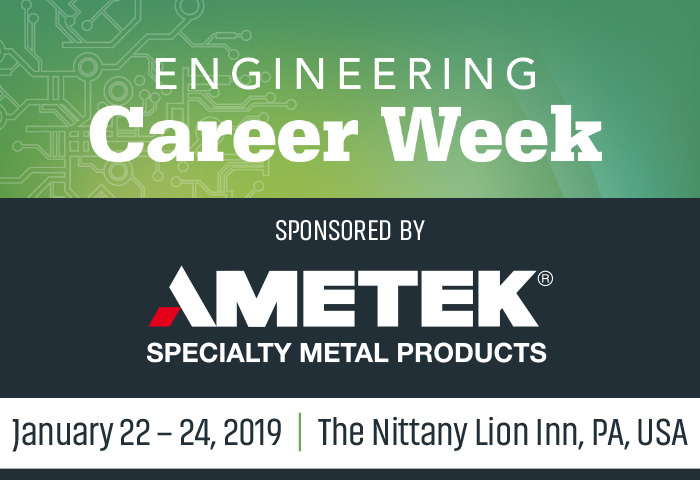 AMETEK Specialty Metal Products (SMP) will attend and sponsor Engineering Career Week, which will be held on January 22 through 24 at The Nittany Lion Inn, the premier hotel in State College, Pennsylvania, USA. The specialist powder, tube and strip manufacturer is sponsoring both the Networking Reception on January 22 and the Career Fair on January 23. Engineering Career Week is co-sponsored by the Penn State section of the Society of Women Engineers. Representatives from each AMETEK SMP business unit, most of them Penn State graduates, will attend the Career Fair on January 23. They will meet attendees interested in pursuing a career in engineering and materials science and discuss the various opportunities currently available within the AMETEK SMP Group of businesses. Those opportunities currently include full-time positions and internships with co-ops planned for the future. As well as offering valuable networking and interview opportunities at the Career Week, the AMETEK SMP team will also provide branded giveaways and ‘spin it to win it’ prizes from their premier sponsor’s booth at Atrium 5. Penn State is a large university that offers students a wide range of majors including engineering, business management, marketing, computer and information technology, communications, and social sciences. Career fairs and other recruiting events are offered regularly with the goals of connecting students with employers and informing and inspiring students to consider a wide range of careers. For more information about Career Fairs at Penn State, go to studentaffairs.psu.edu/career/fairs. AMETEK Specialty Metal Products is a global leader in the production of metal powders, master alloys, clad metals, specialty wire products, metal strip, foil and precision tubes. These materials are used in a variety of applications, including automotive, aerospace, micro-electronics, marine, medical and general industrial. For details about current vacancies and building a career with AMETEK SMP, please visit www.ametekmetals.com/news/careers.